Featuring: Anthony Quinn, Giulietta Masina, Richard Basehart. Director: Federico Fellini. Warning: This movie will stop streaming on May 26th so act fast! Sadly, The Criterion Collection is moving from Netflix over to Hulu Plus soon and many of their wonderful films are expiring in the next month or so. For those of you that are unfamiliar with Criterion, they are dedicated to taking the best films, completely restoring them and making them available in a way that they never have been before. They tend to restore films that mainstream audiences haven't really paid much attention to, but that film buffs love. Basically, expect a lot of Frederico Fellini, Francois Truffaut and Akira Kurosawa reviews on this site in the near future. 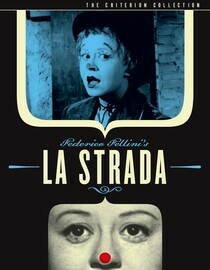 La Strada is a film from famed Italian director Frederico Fellini about an innocent, and very peculiar girl. She gets sold by her impoverished mother to a brutish traveling strongman who performs at circuses and on the streets to hustle up money. He's a drinker, a lover of whores and an all around unpleasant guy. He's played by Anthony Quinn who gives a brilliant performance. His counterpart, played by Giuletta Masina, was wonderful as well. Although, I have to admit, her character is probably one of the hardest to grasp that I've ever come across in cinema. I'm not sure if she is supposed to be simple, childish, stupid, or somehow the smartest one in the film. I don't really get why she stays with Quinn's character, or really why anyone is the way they are. If you're the kind of person that needs answers by the end of a movie this probably won't be a film for you. Sometimes that annoys me, but with this film it added to the incredible charm and fancy of the film. Some of the moments are breathtaking in the most spectacularly ordinary ways. It's a gorgeous piece of cinema that shows the dirtiness of Italy at the time as well as it's striking beauty. As you can see from the last paragraph, it has left me full of contradictions and I couldn't be happier for it. If you're adventurous enough to try movies that feel different, look different and are in a different language then you should try this one out. I really enjoyed my time with it even if I'm not exactly sure why. I know it's saying something about life and love but I have no idea what. That's part of the fun I think, because really, the whole thing could just be saying nothing and I wouldn't know. According to Netflix this movie will stop streaming on 5/26/11. Of course, sometimes they lie. Why is it in your queue? I've recently developed a new appreciation for Italian cinema. Is it artsy? Yes, you could call it that. It's not a bunch of existential bull****, but I'd still call it artsy. What stood out the most to you? Trying to figure that intriguing girl out. Well, that and the incredible setting and cinematography. What mood should I be in to watch this movie? Open minded and with a childlike sense of awe. Sorry, couldn't find a trailer in English. Glad to see you’re enjoying your Netflix subscription. Did you know that Blockbuster offers a similar mail-in service? I actually work for DISH and they’re offering three months free of this service when you switch to DISH. It’s a pretty good deal; check it out at http://goo.gl/wuMrN! Hey! Where are ya? You are missed.